or browse our library of all shortwave radios currently on the market in our Shortwave Radio Index. 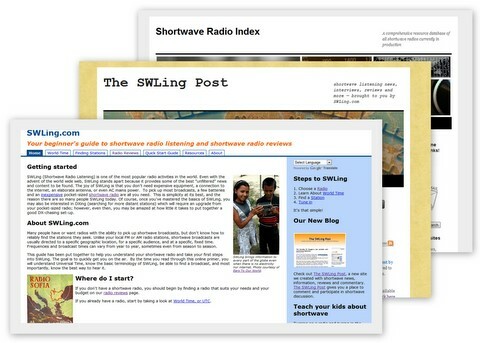 The SWLing Post – (here) We post up-to-date news, reviews, interviews and everything shortwave. New posts are made regularly, often daily. Here, you can easily find our own in-depth shortwave radio reviews. These reviews are comprehensive and typically focus on one model at a time, offering comparisons to other similar radios. The Shortwave Radio Index – At the SWRI we have curated an index of all shortwave radios currently on the market. That’s right, all of them. We add new models each week as they come on the market. The site is searchable by manufacturer, model, or type of radio. Each entry contains features and specifications of the radio with links to reviews on other sites, to retailers and resources for each model. This exhaustive index took some time to construct; as such, we continue to put a great deal of time into maintaining it. As with all our sites, this is a free resource for you to use and share. We always clearly indicate in each review how we acquire review units. While most of the radios and equipment are purchased directly for the review, occasionally, manufactures give us review samples or loaners. This typically happens when the product cost is excessive, a new product has been launched (and we’re receiving a pre or first production unit) and/or the review unit is not one the reviewer wishes to add to their own inventory. When we indicate a “loaner” we’re referring to a review unit that has been sent to us on loan. We typically keep these radios for the length of time it takes to complete a review, then we send the unit back to the manufacturer at our own cost (though sometimes the manufacturer pays return shipping). When we indicate a “sample” we’re referring to a review unit that has been sent to us at no cost and the manufacturer does not want the unit returned to them. We actually prefer loaner review units since it eliminates what could be perceived as a conflict of interest when doing a review. In truth, though, many manufacturers find it a hassle to issue loaner units on products that are relatively low cost–it’s cheaper for them to simply send it as a sample. Quite often we request a loaner, but are sent samples and don’t discover this until the unit is received. What do we do with samples after the review? Sometimes we keep them in inventory if they can be used as a benchmark for future comparison. Most often, though, we give them away shortly after the review. To be clear, no matter how we acquire a radio or accessory for review, we always endeavor to provide our most accurate assessment; our integrity is more important than any piece of equipment. I’m looking for repair shops for Zenith shortwave radios (Model No. 78633r) in the Washington, DC, Maryland, Virginia rea (DMV). I am from Iran and not able to write English. Excusme. I very love a portable radio and in Iran this aquipment’s are big cricket. Whoever, I need to listen to short waves for example bbc or radio card. And I not very perfesional. Please tel me that rescue pl-680 is a good radio for me? I think you do a fantastic service for novices like myself. I don’t puchace a sw radio without referring to your reviews I can’t thank you enough. Could you please send me and instruction manual. I recently purchased a Realistic Dx-302. The large silver tuning ring on front of the receiver is very hard to turn, Is this typical? I lubricated the plastic gears with silicone, but no results. Does anyone have any advise? Here in the the States, we would say “insulated from ground.” In electrical terms, Ground = Earth. For some reason as the years go by,I find ShortWave listening and SSB receiption is getting harder and harder to receive.There is alot more “Hash” or White noise on the airwaves than ever befor,even with my 100 ft long line insulated from earth,I find that all the short wave and SSB utility staitions that once came in so clearly are sometimes just a waste of time trying to receive now.It has put a Damp spot on my listening hobby.I wonder if anyone else is now having this same problem in different parts of the world, live way down under in New Zealand,not Australia,and I remember well when everything came in so clearly,you didnt always need a good antenna.But for some reason now,most of my listed stations and utilities are either just not there or I can not receive them anymore.Whats happened to our favoured hobby? Hi James ,i am from Argentina, yes , its harder try listen some stations, the reason: in my opinion nobody want to transmit in SW cause the AM its very ineficient, only a 25% of the carrier its information, i undestand, that mean that 10KW only 2.5 KW its music , the electricity cost its very important today except to China, use Megawatts of energy in your transmissions, by the other hand , the noise strange noise that you refer, here’s its the same , and must be consider too all the switching lamps cell chargers ADSL internet phone lines , power switching its present replace silents transformers in all you imagine, its very hard ,i’m work in radio ( VHF) and i’am Ham operator too, and the MW band its hard to listen too today, some old stations lower your costs lowering output kw in antenna, and the solar cycle its no the better , frequencias between 500 khz to 8Mhz are suitable to listen today at least here in Cordoba. Internet kill the radio , Norge shut down the VHF FM stations!! of course AM doesnt exist right now very Crazy! Radio its my hobby too form childhood and its very sad all this. I am new into SWLing and I live in a nursing home here in Adelaide and I want to go into SWLing and I am looking at spending no more than $35O.00 and can anyone tell me where I can get a battery operated DIGITAL receiver that does side band and goes from about 3 kilohertz to about 30 megahertz ? Well now that I have logged 98.7 hours on my tecsun pl 880 I have a couple questions for our radio gurus , if this is the right place to ask. I live in a metal sided and roofed house.I have a 50′ long wire antenna and a short pole antenna out along my eve.I have had them up there about as long as I owned my yb 40pe, which I bought from universal radio when they first were available.my questions? 1 I run my pl 880 on normal setting and if I find a weak station on sw I flip to dx, is this bad in my 880? My yb 40 pe worked all those years and never had a problem.its wearing out keyboard is going bad, cleaned it but its used. 2 question have anybody tried wrapping stranded copper bare wire around a 20′ piece of pvc making a tall antenna for shortwave with the goal of reaching above a new shed beside my house? Must say am is great even in my house.its pulling in more than the yb ever did and lots better shortwave.fm is about equil on both radios.but my yb always did greatt on fm. 2 weeks ago I took my tecsun out in the yard and it really did great in am, fm, and shortwave using its stick antenna. I was almost afraid to buy a tecsun , I was always a grundig person.sadly I bought a s 450 dlx bad move shoulda read reviews. I need your expertised. I am looking for a portable radio that has AM, FM, shortwave, and narrow band (SSB) for air traffic. Also the weather NOAA would be nice. I want a radio that has alternate power sources including AC , rechargeable battery, ability to put in store batteries (eg. AA), crank wind up, and solar. A separate wire (about 25-30 foot long) antenna for better reception also. I have researched for weeks now. Some radios (eg. Kaito KA600) sound good, but then so many reports say the reception is terrible, the crank must be turned for several minutes just to have a few minutes of play time. Others sound great, but don’t have shortwave. HELP ! Any radios out there that have what I am looking for with very reception and with efficient solar and crank abilities. I am not concerned with whether it has a flashlight, compass, reading light, ability to charge a cell phone, etc., although those would be nice added extras. I am interested in old time shortwave radio units. If you know of a site or if you yourself Sell old time shortwave units please let me know. Send me an email and I will contact you. Thank you. Your site is very informative and has helped me with the Kaito shortwave unit that I have. I don’t have the equipment to do proper receiver sensitivity and selectivity testing. I’ve actually asked Rob, in the past, if he’d be interested in testing some of the portables I review. I might check with him again soon. The old Sony Sw 55 has gone back to sleep! !.I decided after three days of non stop operation,on many different utility stations,enough was enough! !I just had to turn it off and give it a rest.But,I wasnt sure if it would power up again.I had my douts.Yes my douts were true.Yet again,it has died.It could be faulty caps.So many have noted this with their own,having to replace them,to keep the old Sw 55 going.Well this time I think I shall just leave it in the closset,in it’s cover,with batteries out,and work my Sangean 909X.The Sony sw55 did always have very “quivery” SSB.But other than that,it was a great radio with its station labeling,and many other features,well ahead of it’s time.I still treasure it,it was one of my first ever portable SW radios coming away from radios like the Halicrafters and other old valve radios. I have a small collection of very early AM portable transistor radios.Some I’ve refurnished.I find them at markets and op shops.I enjoy collecting them,cleaning them up and getting them going again.Does anyone have the same hobby?I would enjoy any comments please. Yes Thomas,It’s still running,even now as I write this!! Im too afraid to turn it off.I have installed new batteries to back up the computer,but it’s pluged into the wall power supply.I think pressing that “Sleep” timer button was just a “Fluke”.I did take it appart and taped all the caps lightly,but made no difference.Now it’s going after sitting in my closset.Maybe I awoke the ghost ha ha. So for now,SONY did make excellent portable SW/Gen coverage receivers back in their day.The old SW 55 has sprung back into life giveing full strength readings and as sensitive as it ever was.Full marks for SONY.Seeing and hearing is beliveing!! I wrote about my Sony SW 55 a few months ago,giveing up on me,and there were comments about how the caps dry up in that model.Well I did go ahead and buy the Sangean ATS 909X to replace it,and yes it’s a truely wonderfull radio,I simply can not fault it.But getting back to my Sony SW 55.It must be arround 20 years old I suppose,I used it nearly every day,the 500 memory bank was full of Utility SSB stations,it was always nice to hear the old Sony in action right up untill it died a sudden death with no warning.It simply would not turn on any more.So like many others I just put it down to dried up capacitators.Well since then,Ive tried to get it going,by plugging it into the Wall power supply,pressing the “on” button,but no,it just wont turn on.Then,today after it was sitting in my closset for a lenght of time,with no batteries in,I decided to have yet another try.But no it wouldnt turn on.So I started pressing the aray of many buttons it has on the front panel.I would hold different buttons in,while I turned it on.After going through all the mode buttons,I got to the “Sleep” button.Well to my supprise,pressing that Sleep button,and the On button at the same time,it acturly turned its self on.I was really amazed,that the old dead Sony SW 55 sprung into life,with full volume.I pluged in my outside antenna,and there were all my old stations,coming in as if it had never died.I dont want to turn it off now,so I plan just to keep it turned on for as long as possible.If I turn it off,who knows,it may never come on.So now,what about thoughs dried up caps? Ive veiwed You Tube demos of how to change the caps for new ones because of the well known problem,of drying caps with this model,causeing the very problem I had.But it’s operating for now,as if it had never died.Has anyone else had this happen with their Sony SW 55? Unless there is a Ghost in side it maybe?Maybe I awoke it! !.Any comments please?? Wow James–That’s interesting indeed. I’m not sure why you’re getting power on with that key combination. It’s most likely not dried caps if it powers on and sounds fine (unless a cap is the reason the normal “power on” sequence doesn’t work). Something’s amiss, that’s for sure. If you have an experienced electronics technician nearby, you might want to consult them and take the schematic. I bet this can be properly fixed for the long term. Has anyone had any experiance with the Sangean ATS 909? I see the new ATS 909X is out now,but reveiws are not so good campareing it with the receiption of the Tecsun PL660 etc.But with the Sangean one difference is that it has the “Radio Data System”.Is this on all frequencies,or just on the FM band?If anyone can give a reveiw of the ATS 900 that also has this system,please do so.I need to know if the older ATS 900 is still current and stocked,also how good is the SSB receiption,and how is the filtering against strong broadcast stations clipping in on arround 3 mgs to 7 mgs.I once had the 505 model and strong AM broadcast stations clipped in arround those frequencies.Anyway happy to find out all about the ATS 900.Not the ATS 909X. Maybe someone could put it on You Tube aswell.Thanks. I have a Sony ICF 2010. Great radio when it was working. Is there anywhere that fixes these? I have looked all over and have had no luck. Hate to just throw it away. I paid over $300.00 for it new. Don’t throw it away – they are worth Money even if in need of repair! There is a Yahoo group for the 2010, join it, I believe there is some often mentioned who fixed 2010’s, and he is very well recommended. Hi there Joe.If you are having any problems with your ICF 2010/2001D or any Sony vintage portable receiver,I can point you in the right dirrection.They can be the most complicated radio to work on if you are not experianced.Dont worry I have a 2001D in peices right now! !So if you are living in the USA,get in touch with Rod Wallberg.He’s the expert and he’ll see you right.In fact he reads these messages,so I hope he sees yours.Good Luck……I love the good old Sonys!! Sorry Joe,message was meant for Gordon !!. Hello. You need to contact Mr. Walberg. He’s the Guru on the 2010. He mail me for more info. I would agree with Thomas. I am able to listen All India Radio(Hindi) using Tecsun pl-660 and Kaito 321(you need patience to tune in Kaito though). I was getting decent signal for these 2 here in central Connecticut. I am in USA, and would like to listen to radio stations from INDIA. I would greatly appreciate your suggestions. Thank you. The best ever portable smal sw radio ( all Waves Radio )is the Tecsun PL 880. Take it and you will have fun at all. Not the best radio, but a step in the right direction (portable DRM). In Tecsun radio 2010D,as the analog dial has different dial spreads for FM 1,2&3,so that analog and digital readouts match. My querry is,then they ought to have similar different dial spreads for AM 9/10 kHz steps(one for 522-1620 & other for 520-1710).Otherwise it will show wrong dial readings when step is 9 kHz on 520-1710 scale,won’t it? You’re correct that the frequency dial isn’t specific to the different steps, however (and fortunately) the digital display will show the proper steps and frequencies in MW. Apologies as I almost overlooked your comment! I am in India. Many major sw broadcasters faded away I still likes sw services who ever are still on the air. I would like to buy a receiver in range of $100 to 150. Can anyone suggest a set which should be DRM ready. Er kann sowohl Analog als Digitalradio auf UKW . Es gibt Ihn in der Farben weiß und schwarz. Der Website-Link führt zum weißen Gerät. I lost my Grundig YB 400 (or was it a YB350?) in a recent burglary and I’d like to replace it. I’ve been searching for reviews of SW radios in the $75 to $125 range. Can you make a recommendation or two? Size is a small consideration for me as I travel with my SW, mostly camping in remote parts of Baja California. The dimensions of my YB400 were pretty much ideal for me. Thanks. Note that one reader received an (obviously) used one from Amazon.com in a recent Amazon sale. I’d stick with Universal Radio if you’re in the USA. Though I haven’t reviewed them here specifically, the Tecsun PL-660 and Sony ICF-SW7600GR are great receivers as well. All three of these are good bets, though bigger than the YB400. Clear as mud? 🙂 Just a few options. I am similar to yourself and do a fair bit of travelling and previousl owned the Grundig yb400 and have replaced it with the Tecsun PL660 which is a great all round set suitable for travelling you will have no problems with this set. You might wish to look at a DEGEN 1103 or Kaito equivalent with a collapsible fiberglass mast for antenna mounting. I’ve had mine for 4 years and can attest to its lifespan for a sub $100 receiver. Batteries are rechargeable from standard power source, but don’t over-charge them or they’re gone (been there, done that). When it does (rarely) get confused, just stick a pin in the reset button and all is well with the world again. with knobs. my present receiver is an icom-R75. will need to be shipped to me. I wish I had an easy answer for you. The only effective DRM receivers at present are ones tied to PC’s–either IF receivers (like the RadioJet) or an SDR (like the Papp radio, Perseus, Excalibur, RFSpace products, etc.). So, sorry to say that what you’re looking for does not exist at present. Thanks for the question! Yes. As you said no built in receiver at present. But DRM.ORG is making strenuous effort world over for its expansion. None of the big players have come forward to produce receivers at affordable prize. Here in India DRM transmission hours are increased without receivers available to test.